Mangaldai police on Tuesday night arrested one youth congress member and searching for some others on charges of physically attacking a senior party leader from another state in the premises of Rajiv Bhawan and damaging properties of the district party office. The arrested congress member has been identified as Sahid Ali (30), son of Faqrul Islam a resident of Nanglichar under Shyampur PS of Darrang district. 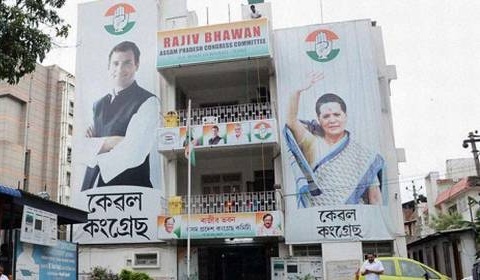 The accused along with a section of arrogant followers of Abdulla Sheikh, a candidate for the post of District Youth Congress President on Tuesday afternoon physically assaulted one Golam Murshed of West Bengal, the Returning Officer for the Young Congress organizational election following announcement of the election result. Abdulla Sheikh had lost to his rival candidate Humayun Kabir by a margin of 66 votes. The losing candidate and a section of his supporters allegedly held him captive inside a room of the Rajiv Bhawan and assaulted mercilessly. Surprisingly none of his party colleagues came to his rescue. Later, a police team rescued him from Rajiv Bhawan. Meanwhile Humayun Kabir lodged an FIR at Mangaldai PS against Abdulla Sheikh and a section of his supporters and party members including Shah Alamgir , Dulal Hira , Ibrahim Talukdar , Wahidur Rahman and on the basis of the FIR a case (No. 495 / 18 U/S 120 (B), 171(F), 325, 307, 379 and 427 IPC ) has been registered in Mangaldai PS as informed by the Officer in Charge of the PS Niranjan Barua . It may be mentioned here that on Monday election for various organizational port folios from the LAC level to District level was held peacefully through online voting where of the total 900 eligible youth congress members only 519 voters exercised their franchise.